MANAGUA, Nicaragua. November 29, 2004,- Costa Rica successfully defended the crown as volleyball zonal queen with a triumph in straight sets over Guatemala in the final match of the XIII Women’s Central America Cup. MVP Verania Willis led the Costa Ricans in the victory 25-23, 25-16, 25-23 for their tenth title –seven in a row- in the history of the event. 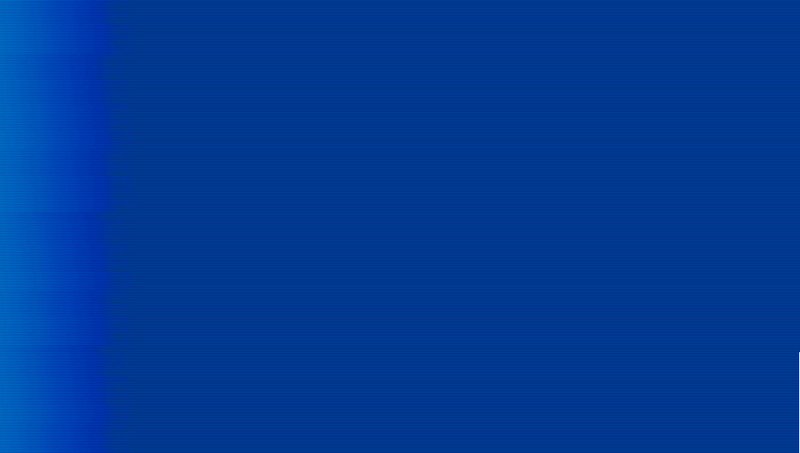 In the match for the bronze medal, Nicaragua defeated Honduras 25-12, 23-25, 25-16, 25-18. It is the second MVP for Willis, who also earned the distinction in the 2002 edition also in Nicaragua and in the same court –Polideportivo Espana. “She was outstanding,” said the coach Braulio Godinez about Willis, one of two siblings in the team. “Verania has improved a lot since playing in the United States.” More Spanish Pic: Costa Ricans celebrates after match point. MANAGUA, Nicaragua.November 27,2004- Just like two years ago and in the same stage, Costa Rica managed to handle Nicaragua a lesson in women volleyball before 2,000 spectators at Polideportivo Espana in the final day of preliminary round of the XIII Women’s Central America Cup. Last night the Costa Ricans prevailed in three sets over the Nicaraguans (25-23, 25-23, 25-22) securing a berth against Guatemala in the final match and sending the host team to the dispute of the bronze with Honduras The surprising loss against Guatemala in the preliminary round left the “Nicas” with the rope around the neck with the obligation to beat their south neighbors in three or four sets. More Spanish Pic: Nicaraguan Heidy Rostran against Costa Rica's wall. ATHENS, Greece August 19, 2004 – The USA men’s Olympic volleyball team ran into a Russian road block Thursday night. Russia used its considerable advantage in size to thwart multiple American attacks and the result was a 3-1 victory at Peace and Friendship Stadium in the final match of the day. Stanislav Dineykin scored a match-high 25 points on 20 kills, three blocks and two service aces as the Russians posted a 22-25, 25-20, 25-16, 25-23 victory to improve to 2-1 in Pool B in the tournament.Alexey Kuleshov was the biggest barrier for Russia as he added 18 points on a match-high nine blocks and nine kills. In fact, Kuleshov outblocked the entire USA team, 9-8. Overall, Russia registered 19 blocks on the night. Canadian h opes of gold tarnished by Dominican Republic. 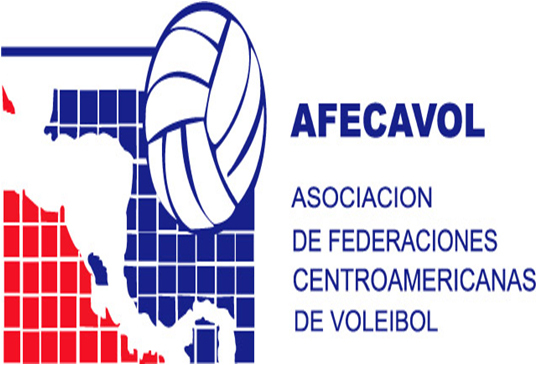 WINNIPEG, Canada, August 3, 2004.- Teams of Cuba and Dominican Republic had strong showings during its debut in the NORCECA´s Women Junior Continental Championship scoring victories over Mexico and Puerto Rico in straight sets. Cuba defeated Mexico 25-15, 25-20, 25-20 in the first match of the competition and Dominican Republic dominated Puerto Rico 25-23, 25-15, 25-22. The Dominicans come from a preparation tournament in Brazil where they faced the strong competition of China, Italy and the host Brazil and it showed on the court today. Caguas, Puerto Rico, January 4, 2004 - Cuba opened the NORCECA Men's Olympic Qualifying tournament in Puerto Rico with a powerful 3-1 defeat of Canada overcoming some strong resistance from the North Americans before running out winners 26-24, 25-22, 16-25, 30-28. The potent attack of the islanders was devastating against a Canadian team with great blocking ability. Canada battled strongly but could not get the key points. "Tonight Cuba was almost perfect and we could not deliver in the important moments," said Stelio DeRocco, the Canadian coach. "Now we have to concentrate on the match against Puerto Rico. The tournament is just beginning and losing the first game is not a sign of elimination, there is still everything to play for right up to the last day." Santo Domingo, December 16, 2003 - The Dominican Republic crushed Mexico 3-0 in the nightcap of the opening day of the NORCECA Women's Olympic Qualifier. It was a powerful show from the host team considered to be the toughest rival for the favorite Cubans. The score was 25-17, 25-16, 25-8 and the match lasted only 58 minutes.“Our team has been training very well and has improved a lot in the tactic and defensive game and we hope to keep improving,” said Jorge Garbey, the Dominican coach. More Spanish Pic: Dominican Kenia Moreta attacks the Mexican wall. December 14, 2003 - Jorge Garbey, the Dominican coach, says Cuba is the team to beat in the NORCECA Women’s Olympic Qualifier and he thinks his squad has the tools to fulfill the task. “Cuba is the favorite in this tournament and we would have to play a great game to beat them,” said Garbey of Cuban nacionality. “But we have done it before and we can do it again. The team has been training hard and is in good shape.” More Spanish Pic: Bautista Yudelkys (DOM) attacks against Munoz Barros and Ortiz (CUB). December 13, 2003 - Cuba is the heavy favorite to win the Norceca Women’s Olympic Qualifier and coach Luis Felipe Calderon pronounced his squad as ready to make it to Athens. The tournament will be played in Santo Domingo starting this Monday 15 with teams also from Canada, Mexico, Puerto Rico and Dominican Republic.“We know that there are some good teams here but we are prepared to win the tournament and the right to be one of the twelve teams in the Olympic Games,” said Calderon. More Spanish Pic:Luis Felipe Calderon is optimistic about Cuba's chances for qualifying to Athens. 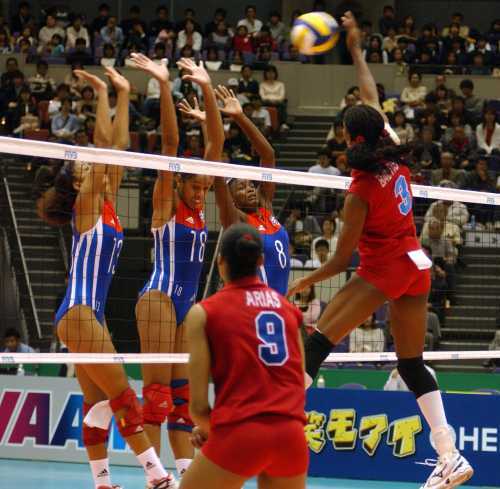 Santo Domingo, Dominican Republic, Aug 16, 2003 – In a giant-killer final for the gold medal match in women’s Volleyball at the Pan Am Games, the Dominican Republic scored a huge victory against Cuba to claim their first-ever Volleyball medal from this prestigious international event. Santo Domingo, Dominican Republic, Aug. 16, 2003 - Venezuela’s Harry Gomez was the happiest player on the court at the end of the Pan Am Games Volleyball tournament, taking home not only the gold medal, but also to be honored by being named “Most Valuable Player” after his team pulled off a sensation in the final, beating Cuba. “To be named Most Valuable Player after winning the god medal is the icing on the cake, you can not ask for more,” Gomez said. He added that the team hard preparing for the Pan Am Games and he had told his teammates before the final that they 'still had one match to win'. “We went to the court to play as hard as we could and the outcome was that we won the gold medal. It is the first medal in the history of Venezuela in Pan Am Games and we won it through the work of the whole team,” Gomez said. Santo Domingo, Aug. 16, 2003 - Venezuela gave Cuba a lesson of good volleyball and dominated in straight sets the defending champions of men's volleyball in the Pan American Games with score of 25-23, 25-18, 25-20. August 10, 2003 - Cuba will face USA and Venezuela will meet Brazil in the semifinals of the Pan American Volleyball men’s tournament following their respective victories over the Dominican Republic and Canada. Cuba beat the Dominican Republic 3-1 ( 25-18, 21-25, 25-18, 25-11) while Venezuela scored a straight sets victoy over Canada. “We were prepared for a much tougher match,” said Eliseo Ramos, the Cuban coach. “I think the way we won the first set calmed down the crowd.” Now we are going against United States and our goal is to win that match and play for the gold medal,” he added. “My team needs titles,” said Ramos. “It is a young squad that is coming off a tough World League campaign and need to accomplish some motivation goals.” More Spanish Pic: Ariel Gil of Cuba hammers past Wagner de Leon as Osmany Juantorena watches. August 07, 2003 - The US Men’s national team advanced unbeaten to the semifinals of the Pan American Games’ Volleyball tournament after defeating Venezuela in a tough five set battle 25-18, 25-20, 20-25, 13-25, 15-10 on Thursday. 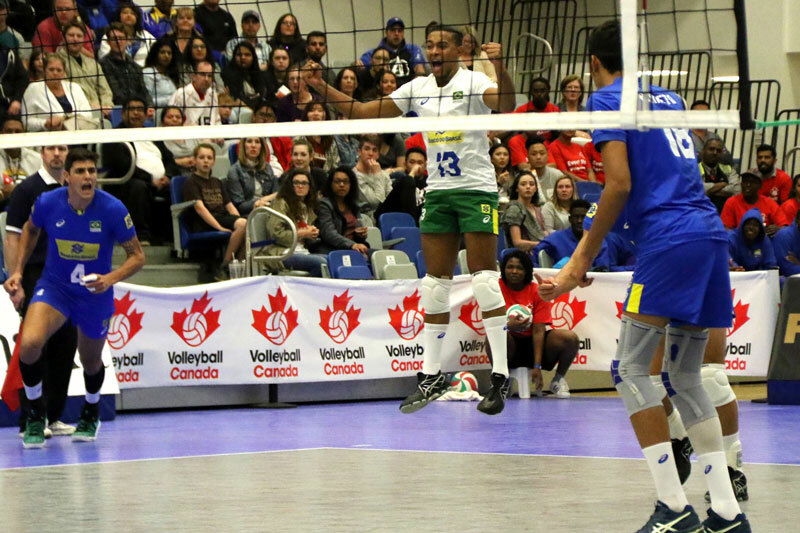 WINNIPEG, Manitoba, Canada – Riley Salmon scored 16 points to lead four players in double figures as the U.S. men's national volleyball team defeated Canada in five sets Thursday night at the University of Manitoba' Investors Group Athletic Centre. br> Salmon (League City, Texas) had 12 kills, three blocks and one service ace in the 25-18, 15-25, 25-21, 30-32, 15-9 win, the finale of a three- match series between the two teams. Story by Confederation Press Officer for NORCECA Roosevelt Comarazamy. Pic: Martha Sanchez succesfully spikes against the Mexican blockade. COLORADO SPRINGS, Colorado. - Long Beach State University women's volleyball head coach Brian Gimmillaro is this year's recipient of the USA Volleyball All-Time Great Coach Award. In receiving the 2003 Donald S. Shondell Contemporary Division Award, Gimmillaro joins the company of the best volleyball coaches in history, including previous Olympic coaches as well as a few of his peers. The award is presented each year by USA Volleyball, the National Governing Body of the sport, to recognize the all-time great coaches of Volleyball. COLORADO SPRINGS – Setter Jen Flynn, who helped guide the USA women’s national volleyball team to a silver medal at the 2002 World Championships in Germany, has retired from the sport effective immediately.